This easy Margherita Pizza gets its name because all you need is a pita for the base. 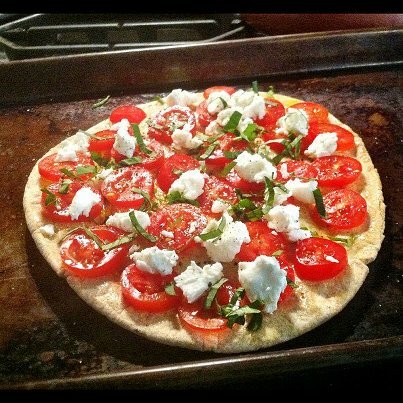 During the summer, I love to make this pizza when the tomatoes and basil are overflowing. The cheese selection depends on what I have on hand, but my favorite is goat cheese. Only four ingredients in this easy margherita pita pizza and you are set. I substitute depending on what I have on hand: yellow or red tomatoes, goat or mozzarella cheese. The key is a nice sprinkling of salt and pepper, plus a good layer of olive oil to soften the pita bread. You can find more recipes for pizzas and pita pizzas in my Recipe Box!